There is something about Jason Reitman’s ability both as screenwriter and director that enables him to do the most audacious tasks. Whether it’s clearing the smoke on the dubious debate between government and tobacco industries, bringing life to a taboo tale of a pregnant teen or travelling the gap between corporate America and the American, Reitman is always on board. Ryan Bingham (Clooney) is in a business that thrives off of America’s deteriorating businesses. The old school corporate executioner travels all over the US, city to city, visiting companies with lists of middle managers and other white collars who are to be fired due to the economy. When bosses are too cowardly to break the bad news, it is Bingham’s job to sweep in and let them down as softly and suavely as his persona, which is why he does his job so well. In addition, he gives them a load of garbage about all the new opportunities and resources available to them. It only makes sense that he gives motivational speeches about the same sorts of subjects at business seminars and conventions. He does it well, and he loves doing it. Living a life of a nomad business man is exactly what he wants, so that he can detach himself from family, materialism and miserable grounded lifestyle led by the people which he fires. Bingham is flying high until his company looks toward a young ivy-league hotshot (Kendrick) who proposed the company begin using an online model to cut out the travelling budget, putting Bingham’s job and lifestyle out of business. The new challenges he now faces are similar to the great challenges America is facing. Streamlining and digitizing isn’t just for corporations anymore, it’s for people, and it’s making us change the way we look at business and our lives. There is a constant back and forth between the traditional and the new. It is an interweaved story of relevance and at the forefront is a fantastic character who must understand why he’s wandering through the world and what he needs to start bringing with him. It’s as good socially as it is as a film. He tears the spine out of Walter Kirn’s novel and gives it a whole new genetic makeup, one the audience can really feel. Reitman’s mostly subtle and conventional techniques are never too bold, but still as clever and sharp as the film’s smooth sailing dialogue. Clooney is suave as hell and fits into the role as snug as a suit. Kendrick is biting and ambitious which makes her chipmunky character comedic delight. Farmiga is perfectly cast next to Clooney as one of the few women who can hold her own against his charm, even one upping him every now in them with her effortless sensuality and intrigue. From takeoff to touchdown, Up in the Air is flawless piece of entertainment that can stand the test of time to classic Hollywood, both in its germane humor and cultural journey from the traditional to the contemporary. The third time is truly a charm for Reitman. This entry was posted in Best Picture Nominee and tagged Best Picture, George Clooney, Jason Reitman, Juno, Up In the Air, Walter Kirn by LukeMiller. Bookmark the permalink. I have really enjoyed reading your review. I am glad to see you enjoyed Up in the Air as much as I did. I found this to be the best film I had seen in quite a while. I really got lost in it all, I related to Kendrick’s character a lot being the same age as her. I’m glad you enjoyed the review. Somehow I just knew I was going to love this movie. I was worried about Kendrick in this movie given her Twilight gig, but she showed up and played it with some real teeth. Even though I have seen both the Twilight films and for a brief time really loved the books I couldn’t even place which part she took in Twilight when I went to see this film. I also kinda knew I was going to love this movie as well. It won’t, but I kinda hope that it will win some Oscars, even if it’s just Kendrick for best supporting actress. Outstanding review. I thought the movie sort of sagged intermittently but in all, it was a solid and entertaining movie thanks to 3 very good performances. 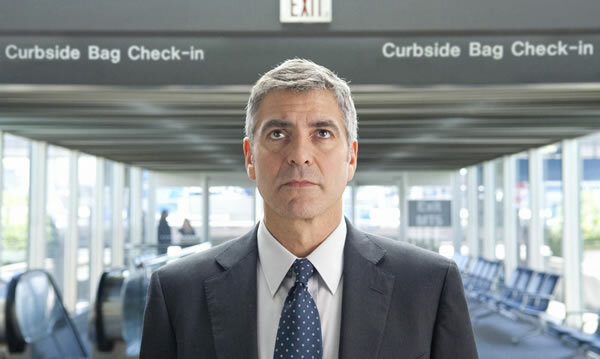 I do feel that Clooney was pretty much playing himself in that one though… odd feeling. I’ve seen all three of Reitman’s films and this one is my hands-down favorite. He’s softened his edge a little bit to make a terrific bittersweet comedy (light on the comedy, I’ll admit) that, cliched as it sounds, really is a movie for this time and no other. This is, in my opinion, the best I’ve seen of Clooney, and he’s perfectly matched with Vera Farmiga. You said it, about being perfectly matched with Vera Farmiga. I’m glad Reitman stuck with her when the studio was pushing him to recast because of her pregnancy. Thanks for stopping by. Yeah, the writing is excellent in this movie and Kendrick’s character is hilarious stuff to look at. She does a great job with it too. The problem is, at least from what I have experienced, is that college lectures and textbooks have a lot of bark, but not a lot of bite. I’ll be sure to check out your website.